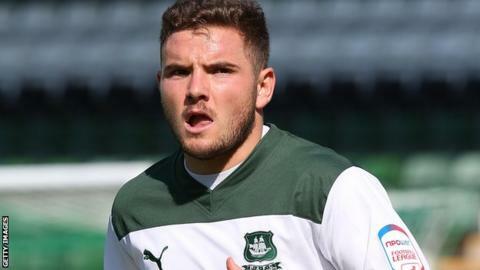 Alex MacDonald says he would be open to the possibility of making his loan move to Plymouth Argyle permanent. "I'm open to it, but it's not up to me, it's not my decision," the Scotland U21 international told BBC Radio Devon. "If the time came and it was right for me and my family then it's definitely something I'd be interested in." MacDonald has started just two League Cup games in his Burnley career as well as making 15 substitute appearances in more than four years. He has also had loan spells at Falkirk and Inverness Caledonian Thistle. "I've always said that I like it down here," MacDonald said. "I like the fans and like working under the manager so I'm enjoying it. "I'm playing out wide, I'd prefer to be playing up front, but I've got freedom to go and roam about. "I'm playing every week again and there's nothing better than playing a game on a Saturday at three o'clock." And MacDonald is confident that Argyle's form in League Two will continue to improve. "If you look at the games from the end of last year to the start of this year we're progressively getting better and better," he added. "We're playing better for longer periods of time and someone soon's going to get pasting off us. "We're all enjoying it and playing with a smile on our faces and a freedom."